We’re often not thankful to have escaped unpleasant things of which we have no understanding or experience. Brits who haven’t had the dubious pleasure of guzzling sweets from the Soviet Union-you simply have no idea just how fortunate you are to have been born and raised in the United Kingdom. So we decided to bring you our very own Ultimate Guide to British Sweets. The most famous invention from the Victorian era were novels aimed at unenthusiastic 20th century school children. Or rather novels so well-written that school children over 100 years later would still be studying these classics. You might be wondering what all this has to do with sweets? The connection is that the Victorian era produced not only classic novels but also many of the classic sweets which we all remember. Historically sweets and confectionaries were hand-made luxury items available only to kings, queens and aristocrats. The industrial revolution brought about many technological advances; lowering prices for refined sugar and allowing for factory produced sweets and confectionary. Owing to these changes, sweets were no longer luxurious items for the super-rich. Pear Drops, Sherbet Lemons, Cough Candy, Rhubarb and Custard, Aniseed Twists, Marshmallows, Candy Floss, Fruit Pastilles and Fruit Gums all originate from the mid-19th century to the turn of the 20th century. 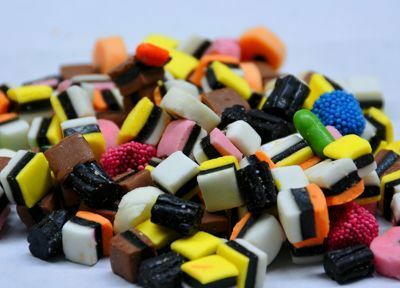 The Victorian sweets with the most interesting back story are Liquorice Allsorts ‘created’ in 1899. According to legend, a travelling salesman dropped his tray of samples. The salesman may have thought that he’s blown the pitch but his customer so loved the assortment of shapes and colours arrayed on the floor that he asked if these sweets could be made intentionally! 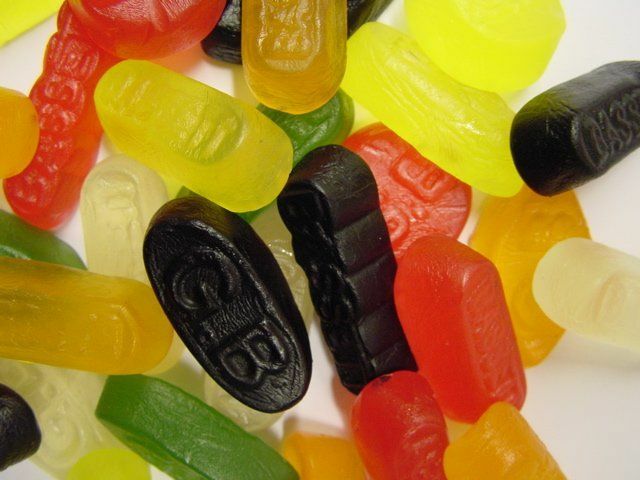 The most famous sweet released during the first decade of the 20th century is the wine gum. Unusually this sweet wasn’t aimed at children but at adults- hence the alcohol inspired name. Although the name might suggest otherwise there is no wine involved in the making of these delicious sweets, children eat these just as gladly. This decade also saw the introduction of the first lollipops! Peace Babies were all the rage when they were launched in 1918 to celebrate the end of the Great War which had devastated Europe. These soft sugar candies are still made today although you’ll probably recognise (and enjoy) them under the name they now go by- Jelly Babies. With Britain struggling to recover from the devastation of world war one, sweet production was not top of the national priority list. 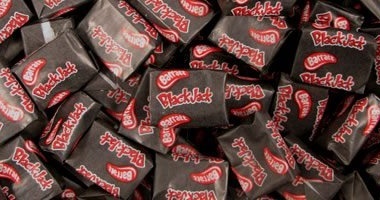 Even so, this decade produced one of the UK’s favourite sweet creations- the Black Jack. The wrapper of this iconic aniseed flavoured chew was originally emblazoned with the image of a golliwog. This was later rightfully considered to be a racist depiction and replaced by a pirate. The contents of the wrapper remain unchanged and just as tasty! Coming hot on the heels of the Wall Street Crash and ending with the outbreak of WW2, you might think that the 1930’s would be a decade to forget for the British sweet industry. However, the attraction of sweets is so powerful that even this dark decade has a few bright sparks. 1935 saw the launch of the popular Extra Strong Mint, a product still available today. In any discussion of the global consequences of the Nazi invasion of Poland, delaying the introduction of the Polo mint rarely gets a mention. The “mint with a hole” was scheduled for launch in late 1939, but the outbreak of war scuppered the manufacturer’s plans. The 1940’s were scarred by war and rationing and even the production of Peace Babies was suspended such were the hardships of this decade. The Polo mint was belatedly launched in 1948. The other iconic sweet launched in the 1940’s were Parma Violets. The 1950’s saw the introduction of one of the most iconic sweets ever created- Love Hearts. These hard tablets of fruit-flavoured sugary goodness are stamped with messages such as “I’m Shy”, “Kiss Me”, “Its love” and “I Love You”. The same company also launched the world’s first chewable lolly in 1957 with the accidentally invented Drumstick. According to the official story, the son of one the company’s owners was experimenting with a new machine and unintentionally learned that it was possible to make a sweet with two different flavours. Raspberry and milk were chosen an the Drumstick was born! The swinging sixties saw the introduction of many famous sweets, not least the Dib Dab and its rival the Double Dip. These sherbet sensations were innovative in so much as they combined two already popular sweets- the lollypop and sherbet dust- into one irresistible package. A second hugely popular introduction in this decade was the humble fruit chew. These chewable fruit flavoured sweets were sold under the Opal Fruits and Chewits labels. Both have survived to the present day although Opal Fruits are now sold under their global name- Starburst. The final intergalactic addition to the confectionary universe was the now infamous flying saucer. The release of a sweet made from sherbet packaged in an edible paper in the shape of a flying saucer was bound to be a hit in an era where the space race had captured the popular imagination. The biggest innovation in the world of British sweets during the decade of flared trousers and polyester shirts was the introduction of Pacers. The delicately flavoured, mild minty chews were a relaunched version of the sweet originally known as the Opal Mint (yes they were the sister of Opal Fruits) and the addition of three green stripes proved a huge hit. These were discontinued in the 1980s and are sorely missed. Growing up in the 1980’s Britain would expose you to wondrous inventions such as the leg-warmer and imported TV shows like Dallas and its rival which my dad named Dysentery because he thought it so awful (that’s Dynasty if you didn’t get it). This decade also saw the start two enormously popular phenomena both with the same name - one a pop duo involving George Michael and Andrew Ridgeley and the second a fantastic chewy and fizzy bar of raspberry flavoured goodness. The UK has a heritage in confectionary which stretches back over a hundred years and the British should be as proud of our sweets as the French are of their wine or the Italians of their shoes. Tell us, what are your favourite British sweets from the era you grew up in?